Arizona dispensaries could sell marijuana extracts and popular types of edibles without fear of legal repercussions if a lawsuit filed Monday by the American Civil Liberties Union is successful. A favorable court decision would be a major win for the MMJ industry, allowing medical marijuana centers to offer a more diverse lineup of products, boost revenues and cater to a different segment of the market. That, in turn, could convince thousands of additional patients with qualifying medical conditions to apply for MMJ cards. “This would bring in many new patients that previously haven’t considered MMJ as an option because they have to smoke it, and that would be significant from a business perspective,” said Ingrid Joiya, who runs Pure Bliss Medibles, an upstart edibles company opening next month. Pure Bliss plans to initially use raw cannabis in its products but would begin incorporating extracts if the lawsuit is successful. Extracts, concentrates (hash, kief, cannabis butters, etc.) and related products – such as edibles and vape pen cartridges – account for a huge chunk of revenues at dispensaries in other MMJ states and are a rapidly growing segment of the industry. Denver Relief in Colorado, for instance, said 50% of its sales are tied to edibles, extracts and concentrates, vs. 10% just two years ago. 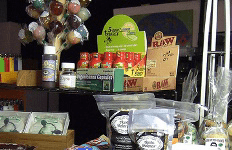 In Arizona, however, extracts – as well as edibles made with them – fall in a legal gray area. A handful of officials, including Maricopa County Attorney William Montgomery, have indicated that the state’s criminal laws do not allow for such products, threatening prosecution against both patients and dispensaries. The medical cannabis industry, however, argues that extracts are indeed covered under Arizona’s MMJ act, falling under the catch-all term “useable marijuana.” The law defines that as raw marijuana and “any mixture or preparation” of the flowers. Given the legal uncertainty, many dispensaries do not offer extracts or concentrates. The ACLU filed the suit in an attempt to shield the parents of a five-year-old boy with severe epilepsy from criminal prosecution for providing their child with cannabis-derived oil. The suit asks the court to officially rule that marijuana-derived extracts are covered under Arizona’s MMJ law. what other states allow extracts or concentrates?